StorageGumbo: vCAC 5.2 Upgrade Gotcha - "Models table exists..."
vCAC 5.2 Upgrade Gotcha - "Models table exists..."
"Error: Model Manager Data has been previously deployed. 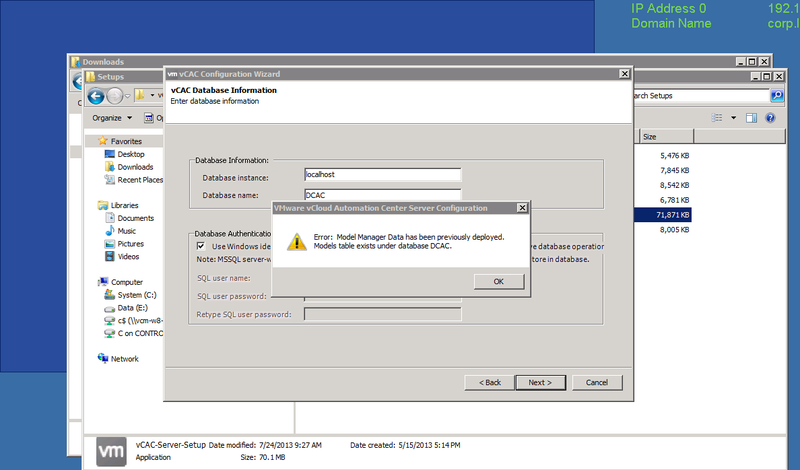 Models table exists under the database DCAC"
You have probably completely uninstalled the previous vCAC instance. Not what you want to do - you will uninstall practically everything else, DEMs, Agents, extensibility features, etc. But, the upgrade still requires the existing core product to be in place. Hope this saves some time for folks. Hat tip to Eric H. for providing the screen shot.